Map of the London Underground circa 1908. The Central Line is in blue - follow it to find The British Museum Station. One of my favorite public transit systems, is of course, The Tube or if you prefer the London Underground (Side note: The Subway in New York wins for better hours - does not close - and the Metro in Washington D.C gets points for the fact I can use my cell on phone when I need to). This random affection I have makes the current book I am reading even more charming. That book is Neil Gaimain's Neverwhere (1996). This post is not about the novel (sorry to disappoint), but a little tidbit that I discovered while reading: the British Museum Station. I was with Richard (a character int he book) mentally stating, "but there is no British Museum Station." Ah - wrong, wrong wrong. There is a British Museum Station, but it has not been in use since 1933. 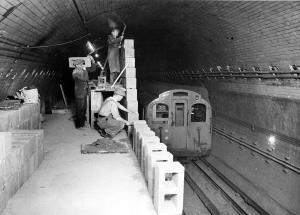 British Museum Station (almost named the Bloomsbury station due to its location in Bloomsbury) was part of the Central line. The exact location of the station was High Holborn and Bloomsbury Court. The exterior view of the station was designed by architect Harry Bell Measures for the Central London Railway. Trademarks of the Underground included included a canopy displaying the Underground logo and station name, poster frames flanking the entrance, and a Tiffany-esque lamp above the entrance. Above the station was a five-story office block. At the time it was occupied by the Beave Board Co, Ltd. (sad note - the surface level building was demolished in 1989). Concerning the interior: the platforms were constructed of wood planking (in 1909 wood platforms were considered to be a fire hazard, which is why platforms are now concrete and steel), lit by electric arc lamps, and like today they included benches for people to sit while they wait and the walls were covered with advertisements. 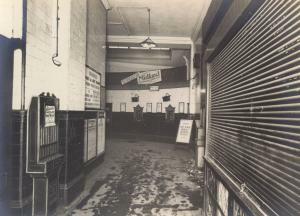 The station was operational from 30 July 1900 until September 1933 when the new Holborn Underground station (the station visitors still use today to get to the British Museum) was opened. The Holborn Station was not only accessible by the Central line, but connected to the area to the Piccadilly line. The British Museum station did find use again. 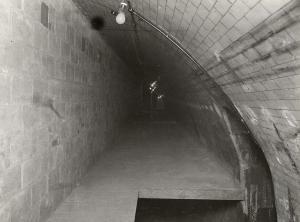 In the Second World War it was used as an air-raid shelter during the Blitz. Photos from the exterior, platform, and booking office hall. Photographs from the Second World War.